The corrugated cardboard charging bag for smartphones and smartwatches can also be used as a door plate in the hotel industry. March 21, 2019 (Press Release) - Thimm develops a sustainable charging bag with additional benefits, thus winning an international prize for haptic advertising. The charging bag of corrugated cardboard for smartphones and smartwatches can also be used as a door plate in the hotel industry. 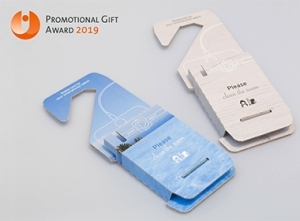 At the award ceremony of the Promotional Gift Award, Thimm was awarded the prize for the corrugated cardboard charging bag in the "Giveaways" category. The trophy was awarded yesterday evening in the World Conference Center in Bonn. The jury of the international competition has been honouring creative and boldly realised promotional items since 2003. The charging bag of corrugated cardboard is a promotional item for the hotel industry that creates added value. In the first step, the corrugated cardboard die-cut piece can be used as a "Do not disturb" or "Please clean the room" door plate. The promotional gift for departing guests also serves as a charging bag. This is suitable for holding all of the usual smartphones and smartwatches. Both the smartphone and the charging cable find space in the plug-in compartment. This avoids tripping. A holding device is integrated for smartwatches. The charging bag can be fixed to the socket with the mains plug while charging. The promotional item is manufactured completely from sustainable corrugated cardboard in E-flute. This size E flute has excellent printing qualities. The die-cut piece is easy to assemble and can be printed on both sides. This results in flexible design possibilities, including for other industries looking for an environmentally aware alternative to plastic charging bags. Thimm Group is the leading solutions provider for the packaging and distribution of goods. Its portfolio includes corrugated cardboard transportation and sales packaging, high-quality promotional displays, packaging systems combining a range of materials and print products for further industrial processing. To learn more, please visit: www.thimm.com.